The German government is continuing to pay pensions to Spanish soldiers who volunteered to fight alongside the Nazis against Russian forces during World War Two, it has been revealed. Following a written parliamentary question from Left Party MP Andrej Hunko, the German government admitted that it was still honoring the agreement struck with former Spanish Dictator Francisco Franco, who actively encouraged fighters to join Nazi forces in the fight against Russia between 1941 and 1943. As part of the agreement, Berlin pays more than US$116,000 (€107,000) a year in pensions to survivors and families of those who fought alongside the Nazis on the Eastern Front as part of the Division Azul (Blue Division). In 1962 an agreement was struck between Franco and the Federal Republic of Germany that saw Blue Division fighters, widows and orphans receive a state pension. In return the Spanish government agreed to pay compensation to the widows of those killed as part of the Nazis Condor Legion, who bombed Spain during the Civil War of 1936 to 1939. It was the Condor Legion that carried out the infamous bombing of the Basque town of Guernica, which inspired Pablo Picasso’s famous painting of the same name. "It’s a scandal that nearly 70 years after the war ended Germany continues to pay more than €100,000 per year to Nazi collaborators. These people voluntarily joined the German fascists in a war of extermination in Eastern Europe and it is incomprehensible that the German government continues these payments while so many war victims are still waiting for their rightful compensation." According to German government figures, 47,000 Spanish volunteers joined the Nazis in combat as part of a deal that prevented Spain from officially entering the war. 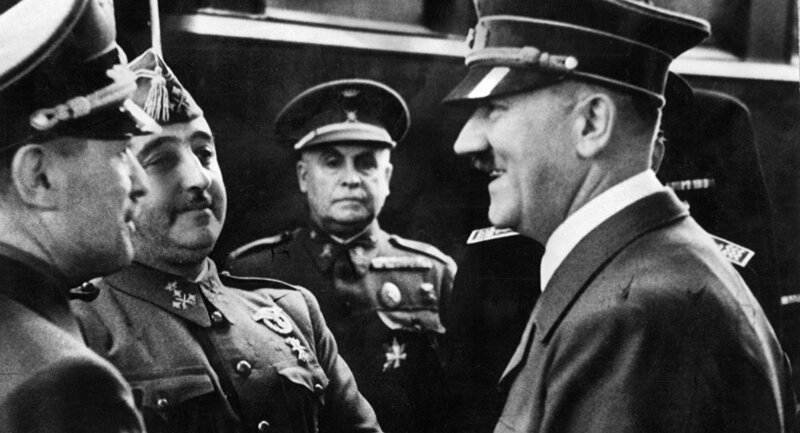 The deal was seen as a compromise for the military support Franco’s forces received from Adolf Hitler’s Germany and Benito Mussolini’s Italy during the Spanish Civil War of 1936-1939. The written parliamentary answer said that 22,000 Spanish Blue Division members were either killed, wounded or declared missing during the Second World War. The Munich Agreement: West's Political Conspiracy Against Stalin?